Do you know which subspecies of C. scutellaris you get in Massachusetts? The subspecies in Ontario is C. s. lecontei, while C. s. scutellaris seems to be more western and S. c. unicolor seems to be more southern. The different subspecies appear to be fairly distinctive, so it might be nice to give each their own page. There are 2 that are in the northeast. C. rugifrons is the metalic green or blue form, and C.lecontei is the bronze, purplish, or greenish bronze form. Sounds good. From the distributions at NatureServe it looks like Massachusetts is part of the overlap area, with C. s. lecontei to the north and west, and C. s. rugifrons to the south. Is that accurate? Also, this photo appears to be C. s. lecontei and your other one (1) C. s. rugifrons, if I'm interpreting the colours right - is that right? 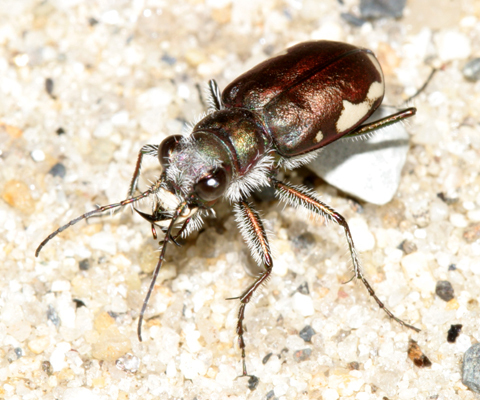 I got the information from the UConn Tiger Beetles of Connecticut website, that listed both subspecies, so it should be the same in Massachusetts. I believe you're right with the photos having both subspecies.